Does My Mom Know AG? Me: Ok, are you ready? A. Made out of canvas with the doll's name, date, and the entails P.C. on them? B. Made out of paper? Or C. There was no tag at all? Mom. I have no idea... But if I had to guess I'd say no tag at all. Me: Nope, B. They were made out of paper. 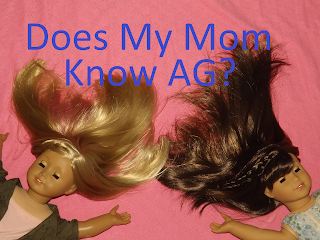 Mom: So you're testing my American Girl doll knowledge? Me: *Bursts into hysterical laughter* I think you know a lot. Me: Well that was kind of a hard question. Honestly, I don't know where I found that one. I was just like "Oh hey! I randomly found out one day that they're made out of paper! Let's see if mom knows!" Me: Ok, so who's my second favorite out of my American Girl dolls? You know my first favorite is Molly, so that would be too easy. Mom: ...... I would guess Emily. Me: Yep! You got it! Me: Kit!....... Saige? Oh my gosh Saige! Mom: She was hard to find! Me: *Laughs* You did a good job fixing her up, she fixed her up by the way! Mom: Saige was in pretty good shape luckily, all I did was curl her hair. Me: Yeah, Saige is fabulous! Ok, who was Girl of the Year 2013? Me: Ok, (<Stop saying ok, please... you say it way to many times in here XD) Who was the historical character that lived in the year 1812? Mom: All the other dolls? Me: *Laughing again, no shocker there* It's Caroline. Me: Caroline's cute! I don't think I could manage her hair honestly. Mom: But she's beautiful though. Me: She is, she's got really incredible eyes. Me: She does have a cow. *Laughs* That sounds weird.... She has a cow!!! Mom: It's a beautiful cow! Me: She just like has this red cow, Yeah! Mom: Maybe we'll be able to find one at the thrift stores! Me: There you go! That would be awesome! Okay, so... Who was the last doll to be produced before Mattel put the hard plastic eyelashes on the dolls? Me: You got this Mom! I told you about this one time.... Think about it really hard. Mom: ....... Was it Felicity? Me: Yeah, she was the last one to be done by Pleasant Company. Mom: Does your Josefina have soft eyelashes? Me: Yep! She was only produced with soft eyelashes for a year and mines a first addition so. Mom: I didn't know she was a first addition. Me: Yeah, neither did I. We just kinda randomly found out, someone on Facebook was just like "Hey! This is how you tell if your Josefina is a first addition!" and I looked at mine and was just like "Oh hello!" Me: Yeah and Addy's the same thing. She's a first addition so she has gold eyelashes and everything. Ok, are you ready? This one's really hard. Me: *Dying of laughter* I wish you guys could have seen the face she just gave me XD Can you name the order I got my American Girl dolls? Me: I actually think you've got this one. Mom: Then I'm thinking it was....... Kirsten? Mom: Then you got Saige! And then you got Josefina. Mom: Then you got..... Addy? Mom: Ummmm, then you got Julie. Mom: Then Parker and Sarah. Me: Yes! You got it! I.... have no idea what question we're on, I think 5? Who's Kit's best friend? Me: Yep! American Girl had one movie that appeared in theaters, which one was it? Mom: It should have been Molly! Me: I KNOW RIGHT?! See, she thinks on the same grounds as me. We both love Molly! Mom: Molly's story is the best! Me: Think about the one I really hate. Mom: Not that you hate Kit! Mom: It's like Toy Story 3! Mom: I don't understand why they have to stray from the stories. Mom: The stories are perfect just the way they are! Me: Yeah, Molly's story changed quite a bit in the movie too. Mom: I like her books. Mom: That was one of the first full books you ever read. Me: Yeah! That's how I learned to read, guys. Molly's books. Mom: Yep, they were cool. I think I enjoyed them as much as you did! Me: Yeah, mom would read them with me :) Ok, I have no idea what question we're on at this point in time.... (I left my notebook with the questions on it at home so I was trying to do this off memory) No clue....Ok, let me think..... *Lovely clicking noises* Which characters are retiring this year (2018)? Mom: Uhhhh, let me see.... IT'S NOT MOLLY!!! SHE'S GOING TO COSTCO! Me: Oh yeah! Molly's going to Costco guys! (LOL You already know that XD) I'm not excited about it.... I'm just like "YOU GUYS CHANGED MOLLY!!!!" Mom: Aren't they retiring Addy? Me: No, they cubed her. Which means they're only selling her online and at flagships. Me: I KNOW RIGHT?!? They just totally whiped out her collection! Mom: They're messing her up anyways, (Along with all the other historical dolls) If you want an Addy buy used. Me: Exactly, guys. The original Addy is GORGEOUS! Mom: Buy it used, get an old one, you'll love it more. Mom: I like the used dolls better. Mom: I like the older dolls, I like the Pleasant Company a lot! Mom: It's like.... Preserving the real American Girl. Me: Yeah... And don't be afraid to buy used guys. I know it sounds kinda terrifying like there's going to be something wrong with them but they're honestly just awesome! Plus you're giving a doll a second chance at life.... Me being all poetic over here! Wait..... W-what question was I asking? Me: Oh gosh that movie has scarred me for life, guys. I can't get rid of toys now, and I blame that movie fully! We did, what was that song? When She Loved Me? Mom: That's not going to be you right? Me: NOPE!!! I honestly can't see me ever stop loving dolls. Mom: You'll just be a collector. Mom: I know lots of them! Mom: ...... I have no idea who else. Me: I'm going to give that one to you anyways.... So there's Z, Tenney, Logan and Gabriela. Mom: Carter has a purpose though. Me: Yes! Carter is here because I couldn't bring myself to use one of my girl doll as the Nutcracker and love interest. Carter was a doll we bought for my business and we couldn't fix him, we tried. So instead we just cut off all his hair and were like, "We're good to go!" Mom: His face is also kind of sunken in. Mom: And his hair was really bad. Super SUPER long haired Target doll. Mom: They're like Rapunzel dolls. Me: I didn't realize that when I bought Lucy, so I was just like "Oh wow! Her hair is really, REALLY long!" and it gets knotted in like, five seconds XD but I can't bring myself to cut it.... So yeah. Mom: It stays in a braid. Mom: So why do you like Molly's books so much? Me: Wait me or you? Mom: It's a very interesting time period... And Molly's pretty spunky. Me: I don't know I think Molly's pretty far from her character in the books. She's very bazaar, she's very wacky. Nobody quite understands her, they just kinda humor her like, "Ok Molly, if you want to wear to different color knee high socks you know...."
Mom: So if you were to get any other dolls who would you get? Mom: Grace is awesome! We fell in love with Grace because.... The pictures that Jewel did on her blog! Me: Oh my gosh yes! Mom: Never cared much about Grace until I saw those pictures! Me: Very, very talented! Extremely talented :) Ok..... Do you know what, I'm just going to call that ten questions. I can't think of any more questions. Mom: Those were good questions, even though some of them were REALLY hard ad I messed them up! Me: LOL that's ok! You got six out of ten(?) though!!! Mom: I thought it was going to be like, "Which doll is your favorite?" The Human! Yes! You shall do this with your mom! (If you want XD) Have a blast! Mom: You must tag Jewel! Mom: Still loving that ninja costume!!! Mom: We should tag the sisters! Me: Rose! From a Doll-op of AG! She spells her blog a DOLL-op of AG! Get it? It's awesome and I love it! Mom: That's awesome! You guys are all so creative! Me: I know! You guys are honestly so inspiring to read your posts and everything, you're all amazing :) Ok, so that's five people tagged! Thank you so much for reading guys! Bye! Say bye mom! If you made it all the way through than thank you so much! I hope you have a blast with the tag and if you want to do it too than totally feel free to do so! So ask your mom or dad 10 questions, tag 5 people :) I love you all and I'm so thankful for you! I just hit 30 followers and I'm overjoyed :) It wouldn't be possible without you! Thank you so much for the time you take out of your day to read my posts, it means the world! Have a blessed day everyone! "She's beautiful, and she's got a cow :D" THAT IS BEAUTIFUL. That was so wonderful! You guys are so sweet!!! You and your mom's personalities were really coming through! It was so cute and silly and... great! What a fun post, Katie! Also, you got Grace because of my pictures?! I saw your Grace doll in the last post, and she is SO beautiful. :) I can't express enough thanks for the compliments, but thank you so much! <3 Your Mom is awesome. Also, thank you for tagging me and my mom! This sounds so fun! Awww thank you so much Jewel! We had a lot of fun and I'm so glad you enjoyed :) Yep! I never really liked Grace, I just didn't feel she was anything special. But when we saw your blog we were blown away! You do such a beautiful job of capturing how stunning she actually is and I just ended up loving Grace :) Thanks! I'm so excited to have her! Aww you're welcome! Thank you! I told her and it brought such a big smile to her face :D I hope you guys have a blast, I can't wait to read it! P.S. Sorry I haven't been commenting lately! I've been back and forth to my Grandfather's house for about a month. We're home right now but it's been really busy cleaning the house and waiting in case we have to go back. You're welcome! Thank you so much! Yay! Hey!! Were are back to blogging! Thanks for tagging us! We are working on the tag right now! Hi Haley!!! Yay! I saw that the other day, I'm so glad you're back :) Awesomeness! I hope you guys have fun!